A suicide bomber has blown himself up in the Chechen capital, Grozny, killing two policemen and a fellow attacker, Russian security officials have said. The bomber had been trying to reach the interior ministry building, but was stopped at a checkpoint, they added. It is the second fatal bombing this week in the southern Russian republic. Last month, the Russian government officially declared that the long-running conflict with Muslim separatists in Chechnya was over. Russian forces have fought two major campaigns against separatist rebels in the republic since the collapse of the Soviet Union. Officials said two men had driven up to a checkpoint about 500m from the republic's interior ministry in central Grozny on Friday morning. One got out of the car, walked up to the police stationed outside and detonated the explosive device he was carrying - killing two officers, his accomplice and injuring five other people, they added. Earlier, security sources told Russian media that the bomber had "embraced" one of the guards before detonating his explosives. Investigators are now trying to identify the remains of those responsible. 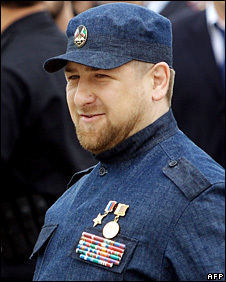 Chechnya's President, Ramzan Kadyrov, later praised the police officers who died for preventing "serious bloodshed". "Those who carried out this act of terror wanted the widest attention, large casualties and put uncertainty and fear into the hearts of the people," he said. But the pro-Kremlin leader insisted Chechnya was still safe. "The incident has not had an effect on the situation in Grozny - in both the capital and elsewhere, the situation is absolutely calm." The attack comes almost exactly a month after the official announcement from Moscow that the "counter-terrorism operation" in Chechnya was over because stability had been restored. The BBC's Richard Galpin in Moscow says it is rare for Muslim rebels to be able to carry out an attack in Grozny, and a suicide bombing is even rarer. It would appear to be a message from the separatists that the conflict is not over and that they remain a force to be reckoned with, our correspondent says. Earlier this week, two policemen and a bystander were killed in an explosion near the village of Belgatoy in southern Chechnya.